Based on the header you might think this is a text about Fortnite, the Battle Royale by Epic Games, and I’ve made a typo. I have not, I am actually and intentionally talking about fortnight. A time period of two weeks. Now that we have that out of the way I can get to my actual point which is the power of positive peer pressure and its role in gamifying life. But before we get to the ‘peer’ part, let’s dissect why I ventured into the realm of working out. Earlier Anne jolted down some thoughts on how to exercise without exercising. I wanted to share my two cents on the matter and also maybe give some firsthand info on what it is like – in practice – to apply gamification to a specific area of one’s life. Nothing much has happened in my life regarding working out without pressure. Moreover, the pressure needs to be positive to work and motivate me to continue on the path of exercising. And that’s how you move from mere peer pressure into the importance of community. The thing is, I’m not good with exercising at home. I have tried several things, buying a crosstrainer being one of them. For a long time, I mostly used it to hang up my clothes. A discussion over coffee with a work friend revealed that both of us own unused crosstrainers. We devised a gamified routine to activate our fitness gear. The larger than life result is ‘Fortnight Challenge’ The goal: use a crosstrainer on seven out of fourteen days. It doesn’t matter if it’s five minutes or an hour, since we’re measuring frequence and nothing else. Setting clear rules in a game means the player does not get confused and they can feel a sense of control and accomplishment while working towards mastering the challenge. Limiting a single challenge in our game to two weeks felt realistic. Like in all larger than life projects, milestones are important. Since last fall we have repeated this challenge nine times and my crosstrainer is no longer covered with clothes. Some might say that I’ve reached level nine in my Fortnight Challenge. The Power of the Trophy Wall Streak: Our 2018 Just Dance weekly wall motivates. Our 2019 wall is already underway. We have an instant mini reward system incorporated into the Fortnight Challenge. When doing the exercise, we take a photo – ours usually show the crosstrainer from some angle – and send it to a Whatsapp group dedicated for the challenge. Then the others send an animated gif to celebrate the achievement. This might sound quite silly but it’s very effective! This ticks two boxes on the Bartle’s player type classification where players are categorised to socializers, explorers, achievers and killers. I’m participating in the challenge because of the community aspect (socializer) but I’m also there for the reward gifs (achiever). 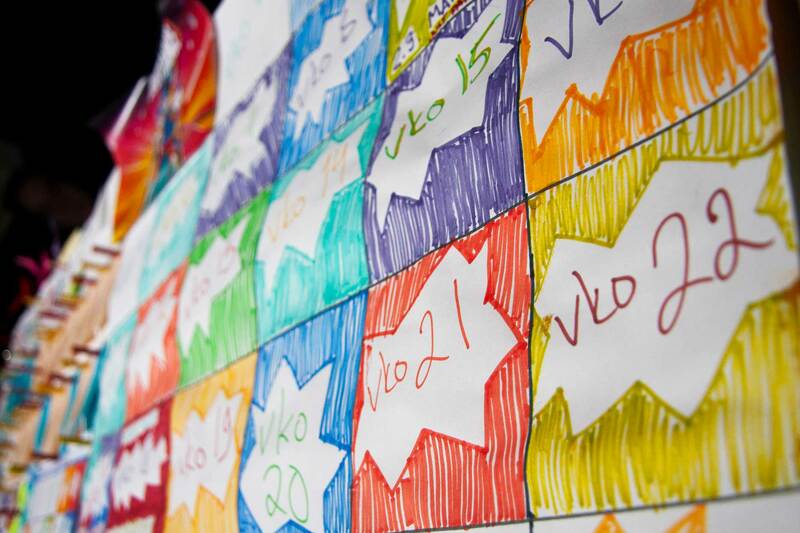 Our Fortnight Challenge is visualized in a happy hand-drawn calendar sheet on the wall. There’s something quite satisfying about this process of filling the calendar. All the finished fortnight sheets remain on the trophy wall. This brings a sense of meaning and history into what we are doing while also boosting the achiever part of Bartle’s classification. Community. Do it together. Find your exercising friends. Gamify it. Make it a challenge: collect badges/try to fill a calendar/whatever works for you. Visualize it. Trophy wall is one motivating thing. Ticking off boxes on a calendar is another. Marja Kuipers works as an administrator extraordinaire at LudoCraft and is always impressed when a hydrobics class playlist tells a story.